or will on their effective dates be increased as provided below, for the period this item is in effect. In applying the provisions of this item, first determine the applicable line haul charge including all applicable increases and/or discounts,if any. The line haul charge so determined will be further subject to the surcharge provided herein. 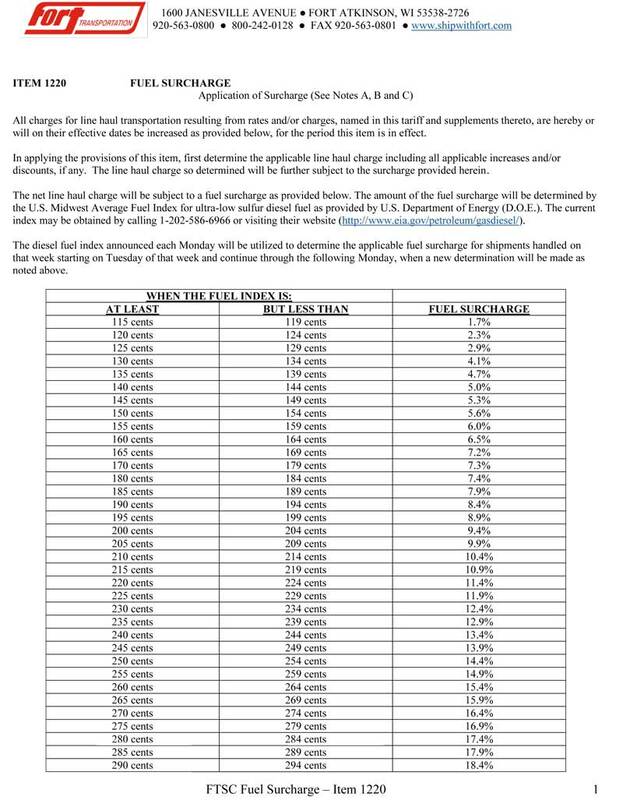 The net line haul charge will be subject to a fuel surcharge as provided below. The amount of the fuel surcharge will be determined by the U.S. Midwest Average Fuel Index for ultra-low sulfur diesel fuel as provided by U.S. Department of Energy (D.O.E.). The current index may be obtained by calling 1-202-586-6966 or visiting their website (link will open in a new window). The diesel fuel index announced each Monday will be utilized to determine the applicable fuel surcharge for shipments handled on that week starting on Tuesday of that week and continue through the following Monday, when a new determination will be made as noted above. increased to the next whole cent. actually bearing the burden of the increased fuel costs. NOTE C – The term “LINE HAUL CHARGES” referred to herein applies to all charges other than accessorial charges. I have worked for a manufacturer as the Traffic Manager for over 22 years. Our freight is primarily LTL and ships all over the country. Fort Transportation has always been a very reliable source for our regional freight. When I need a volume quote or flat pallet rate, Fort has come through with competitive rates and excellent service. They are prompt to pick up and deliver in a timely manner. Our finished products are time sensitive, which requires that we move our product as fast as possible from point A to point B. Fort Transportation has meet our needs for over the past 20 plus years. Fort Transportation and Service Company, Inc.